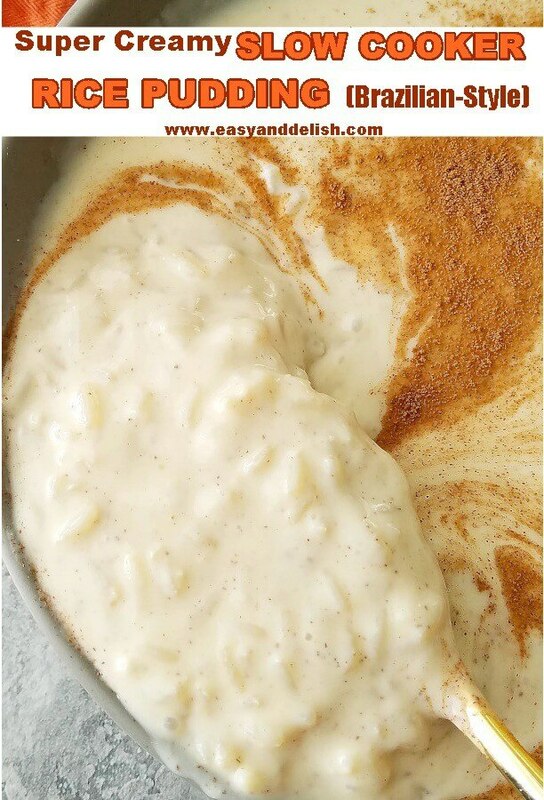 Slow Cooker Rice Pudding is the easy, hassle-free version of a Brazilian classic, making the perfect gluten-free, eggless dessert for any time of year. Serve it either chilled or warm with a sprinkle of cinnamon. So good! 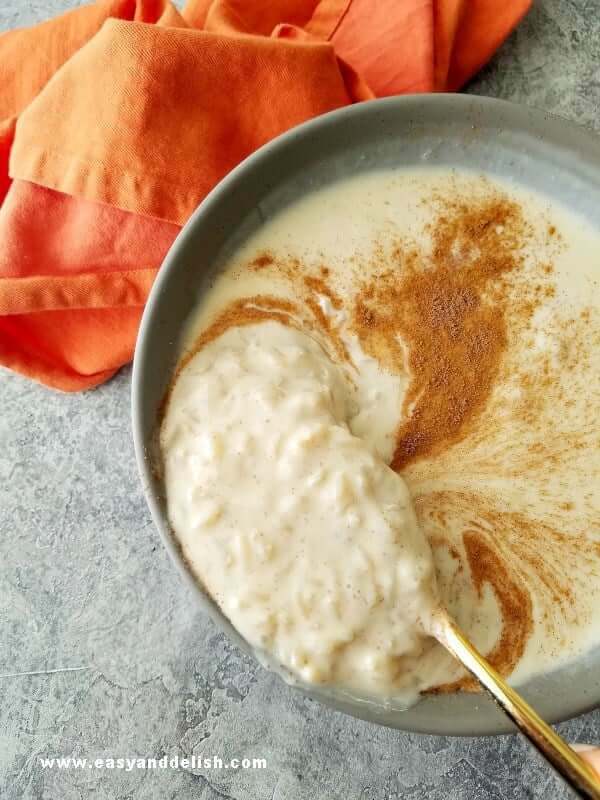 Here is a long-time favorite made in the slow cooker: rice pudding — Brazilian-Style! Every country in the world seems to have its own version. 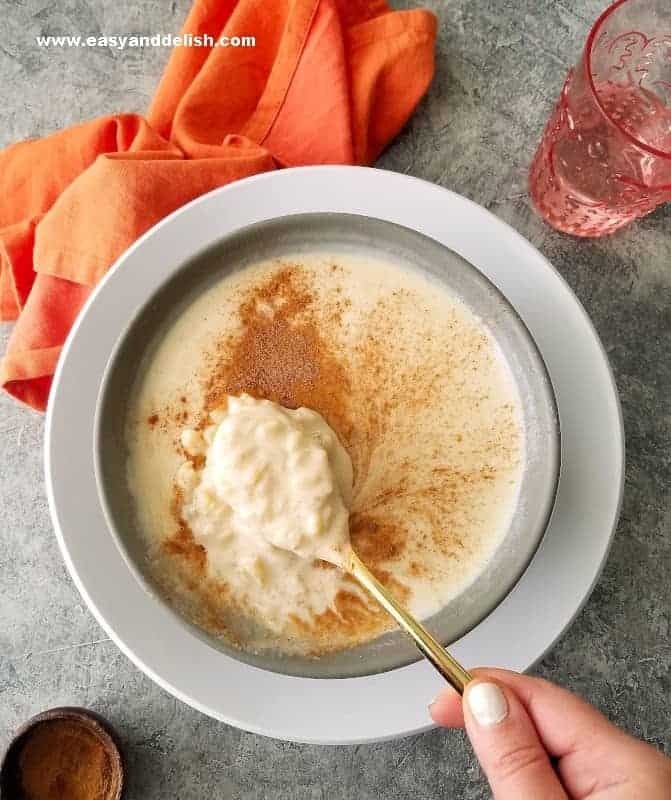 This Brazilian rice pudding (known as arroz doce in Brazil) is made from rice, milk, coconut milk, sweetened condensed milk, sugar, heavy cream, and a lot of cinnamon. Brazilians love it plenty sweet, so raisins are sometimes added too. We used the slow cooker this time, sparing our hands of all the stirring and, as a result, saving us time. A short grain rice, arborio (which is the same type used in making risotto), replaces the usual long grain parboiled rice. In this instance arborio, being a starchier rice, absorbs much of the added liquids and flavors, making the rice pudding creamier and tastier. It also shaves off 60-90 minutes from the cooking process. In other words, it takes 2 hours to cook arborio rice and 3 to 3 1/2 hours to fully cook a long grain parboiled rice. The result is a super creamy (even without eggs), sweet treat that is able to warm and please even the most demanding of palates. Just ask my children! For a version made with eggs and medium-grain rice on the stove top, try our Super Creamy Spiced Rice Pudding. Another real hit! This Slow Cooker Rice Pudding is a comforting, gluten-free dessert suitable for any time of the year. First, mix arborio rice, salt, milk, and either water or coconut milk. Add one cinnamon stick if desired. Cook in the slow cooker for about 2 hours or until rice is fully cooked. Then, stir in sugars, cinnamon, sweetened condensed milk, warm heavy cream, and vanilla until homogeneous. 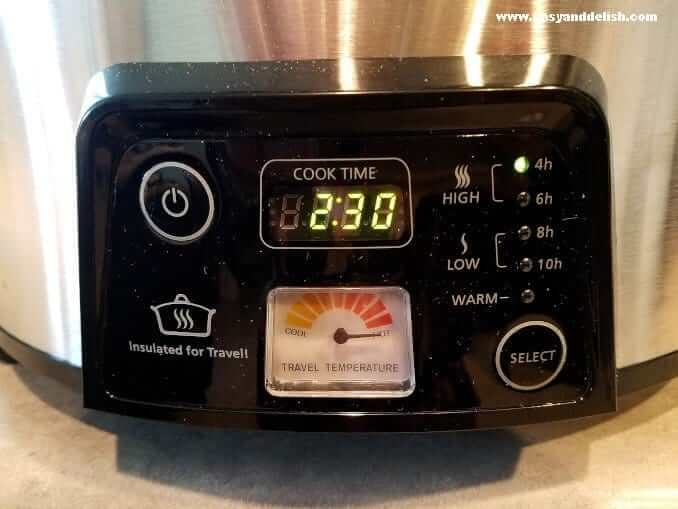 Cook for an additional 15-30 minutes. Remove cinnamon stick, add raisins if desired, and serve warm with a sprinkle of cinnamon. Alternatively, let it cool, cover, and refrigerate until chilled. Serve and enjoy topped with a dash of cinnamon. If the arborio rice is already cooked, the process will be considerably shorter. Basically, place cooked riced into the slow cooker and stir in heavy cream, sweetened condensed milk, sugars, vanilla, and cinnamon. Cook for about 30-40 minutes or until sauce thickens, yet is still a little bit loose (i.e. still has a little fluidity). If necessary, add a little bit more heavy cream to loosen. Just make sure heavy cream is the same temperature as the rice. If cooked rice is cold, heavy cream has to be cold, and vice-versa. This will help prevent the rice pudding sauce from breaking apart or ending up with a curdled look. Well, I hope you that enjoy our crock pot Rice Pudding as much as my family and I did. First, mix arborio rice, salt, milk, and either water or coconut milk. Add one cinnamon stick if desired. Cook in the slow cooker for about 2 hours or until rice is fully cooked. 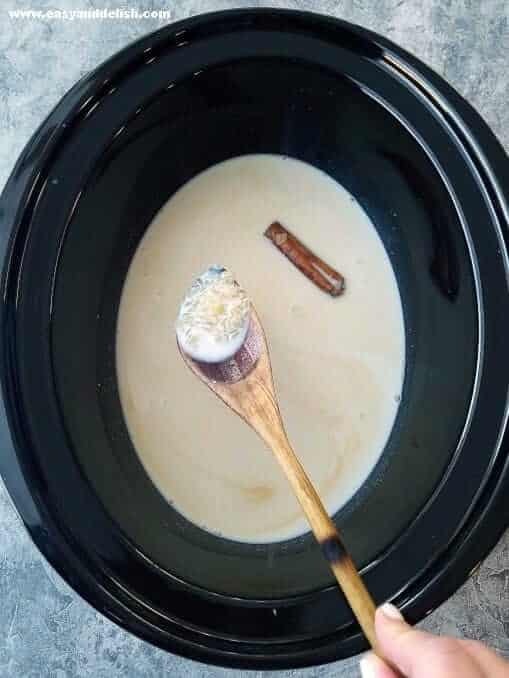 Then, stir in sugars, cinnamon, sweetened condensed milk, warmed heavy cream, and vanilla until obtaining a homogeneous mixture. Cook for an additional 15-30 minutes. Remove cinnamon stick, add raisins if desired, and serve warm with a sprinkle of cinnamon. I prefer mine without raisins; otherwise it adds extra sweetness. Love rice pudding? 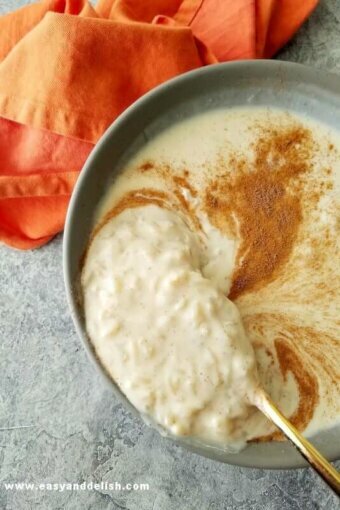 Try our Super Creamy Spiced Rice Pudding. If the arborio rice is already cooked, the process will be considerably shorter. Basically, place cooked rice in the slow cooker and stir in heavy cream, sweetened condensed milk, sugars, vanilla, and cinnamon. Skip milk and coconut milk. Then, cook for about 30-40 minutes or until sauce thickens, yet is still a little bit loose (i.e. has a little bit of fluidity). If necessary, add a little bit more heavy cream to loosen. Serve either warm or chilled. Just make sure heavy cream is the same temperature as the rice. If cooked rice is cold, heavy cream has to be cold, and vice-versa. This will prevent the rice pudding sauce from breaking apart or ending up curdled. 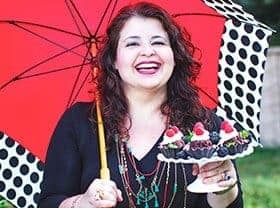 What a heavenly recipe. Using coconut milk adds so much rich flavor to this slow cooker recipe. Rich, creamy, delish — what’s not to like? Terrific looking dish — thanks. The rice pudding turned out great and was so easy to make. Super creamy and delicious. Thanks for the recipe.